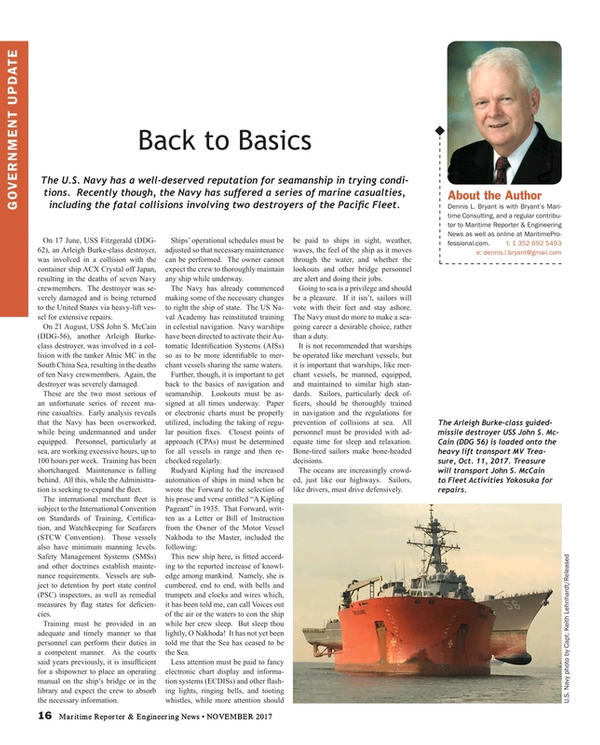 The U.S. Navy has a well-deserved reputation for seamanship in trying conditions. Recently though, the Navy has suffered a series of marine casualties, including the fatal collisions involving two destroyers of the Pacific Fleet. On June 17, USS Fitzgerald (DDG-62), an Arleigh Burke-class destroyer, was involved in a collision with the container ship ACX Crystal off Japan, resulting in the deaths of seven Navy crewmembers. The destroyer was severely damaged and is being returned to the United States via heavy-lift vessel for extensive repairs. On August 21, USS John S. McCain (DDG-56), another Arleigh Burke-class destroyer, was involved in a collision with the tanker Alnic MC in the South China Sea, resulting in the deaths of 10 Navy crewmembers. Again, the destroyer was severely damaged. These are the two most serious of an unfortunate series of recent marine casualties. Early analysis reveals that the Navy has been overworked, while being undermanned and under equipped. Personnel, particularly at sea, are working excessive hours, up to 100 hours per week. Training has been shortchanged. Maintenance is falling behind. All this, while the Administration is seeking to expand the fleet. The international merchant fleet is subject to the International Convention on Standards of Training, Certification, and Watchkeeping for Seafarers (STCW Convention). Those vessels also have minimum manning levels. Safety Management Systems (SMSs) and other doctrines establish maintenance requirements. Vessels are subject to detention by port state control (PSC) inspectors, as well as remedial measures by flag states for deficiencies. Training must be provided in an adequate and timely manner so that personnel can perform their duties in a competent manner. As the courts said years previously, it is insufficient for a shipowner to place an operating manual on the ship’s bridge or in the library and expect the crew to absorb the necessary information. Ships’ operational schedules must be adjusted so that necessary maintenance can be performed. The owner cannot expect the crew to thoroughly maintain any ship while underway. The Navy has already commenced making some of the necessary changes to right the ship of state. The U.S. Naval Academy has reinstituted training in celestial navigation. Navy warships have been directed to activate their Automatic Identification Systems (AISs) so as to be more identifiable to merchant vessels sharing the same waters. Further, though, it is important to get back to the basics of navigation and seamanship. Lookouts must be assigned at all times underway. Paper or electronic charts must be properly utilized, including the taking of regular position fixes. Closest points of approach (CPAs) must be determined for all vessels in range and then re-checked regularly. This new ship here, is fitted according to the reported increase of knowledge among mankind. Namely, she is cumbered, end to end, with bells and trumpets and clocks and wires which, it has been told me, can call Voices out of the air or the waters to con the ship while her crew sleep. But sleep thou lightly, O Nakhoda! It has not yet been told me that the Sea has ceased to be the Sea. Less attention must be paid to fancy electronic chart display and information systems (ECDISs) and other flashing lights, ringing bells, and tooting whistles, while more attention should be paid to ships in sight, weather, waves, the feel of the ship as it moves through the water, and whether the lookouts and other bridge personnel are alert and doing their jobs. Going to sea is a privilege and should be a pleasure. If it isn’t, sailors will vote with their feet and stay ashore. The Navy must do more to make a sea-going career a desirable choice, rather than a duty. It is not recommended that warships be operated like merchant vessels, but it is important that warships, like merchant vessels, be manned, equipped, and maintained to similar high standards. Sailors, particularly deck officers, should be thoroughly trained in navigation and the regulations for prevention of collisions at sea. All personnel must be provided with adequate time for sleep and relaxation. Bone-tired sailors make bone-headed decisions. The oceans are increasingly crowded, just like our highways. Sailors, like drivers, must drive defensively.